I’ve hijacked Tracie McBride’s blog! I’m pleased to welcome Australian author Greg Chapman to my blog today to talk about his novella “The Eschatologist: Post-Apocalyptic”, scheduled for release on January 15. 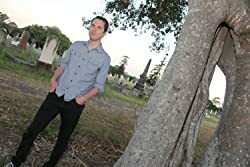 After joining the Australian Horror Writers Association in 2009, Greg Chapman was selected for its mentor program under the tutelage of author Brett McBean. Since then he has had short stories published in The Absent Willow Review, Trembles, Eclecticism, Bete Noire and Morpheus Tales, comic artwork in Midnight Echo Magazine, and several novellas published by various small press. His debut collection “Vaudeville and Other Nightmares” was published in 2014. He is also a horror artist and his first graphic novel “Witch Hunts: A Graphic History of the Burning Times”, written by Bram Stoker Award winning authors Rocky Wood and Lisa Morton was published in 2012. It received the Bram Stoker Award for Superior Achievement in a Graphic Novel.